Certain characteristics of boron nitride suggest the use of this non-oxide advanced ceramic material as a refractory filler in foundry coatings. The Büro für angewandte Mineralogie developed an appropriate coating and in co-operation with the metal casting working group of the FH Aalen the possibilities of an application in particular in die casting and gravity die casting foundries were examined. Coatings are used with both the sand casting process and with the different die casting processes. Beyond that they are used as surface protection for ladles. They have the function to prevent a reaction of the melt with the mould material, to influence the heat transfer between melt and outline-giving surface locally, to enable a separation between cast piece and the mould when discharging the mould. Beyond that coatings may react neither with the melt nor with the mould material. The coating should be able to be applied with an even layer thickness on the outline-giving surfaces, should not adhere at the surface of the cast parts partially and, if they are applied on as wear-coating, they should not build up on the outline-giving parts of the dies. Beyond that they should be environmetally friendly. The characteristics like chemical and thermal stability, thermal conductivity and separation efficiency, necessary for the fulfilment of these functions, depend primarily on the refractory fillers used in the respective coatings. 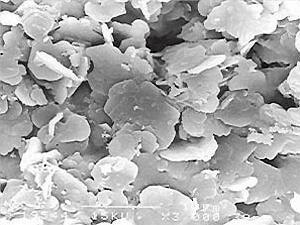 Beside the classical refractory fillers such as graphite also the use of special ceramic materials is considered. Here above all boron nitride is to be mentioned, which indicates a number of interesting characteristics, which make the use as a refractory filler in foundry coatings to appear meaningful . Boron nitride is a synthetically manufactured ceramic substance with the chemical formula BN. For application in coatings a powdered raw material is available, as shown in fig. 1 in an electron micrograph in an enlargement of 3000 times. The plate-like formation of the boron nitride particles can be clearly seen. Thus some plate-like particles can be detected in the left part of this photo, within the middle lower area are some standing particles within the left area of this accommodation, where only their edges are visible. The boron nitride particles have a size of max. 5 to 8µm. Crystal structure. In fig. 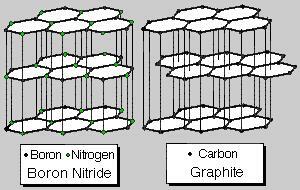 2 the crystal structure of boron nitride is shown and compared with graphite. Both materials crystallize in a layer lattice, whereby the layer distances are very similar. Since boron nitride - in contrast to the graphite - is from white colour, it is frequently called "white graphite" due to its graphite-similar structure. Therefore it is to be expected that many characteristics of boron nitride are very similar to those of graphite. Thus e.g. the individual layers of the crystal lattice are movable as with the graphite with a very small energy expenditure. Therefore boron nitride can also find an application as solid lubricant . Thermal stability. As graphite boron nitride also indicates a very high melting point, which is situated clearly above that of other ceramic materials. In fig. 3 the melting points or points of sublimation of different ceramic materials are shown. Thus graphite has a point of sublimation of 3650°C. Boron nitride is here with a melting point of almost 3000°C in second place. Thus it is clearly above other ceramic materials such as Si3N4, SiC or Al2O3, and as well as ZrO2. However the max. application temperature must be considered with the practical evaluation of the application of boron nitride. This is as with all ceramic materials below the melting point. In fig. 4 the max. 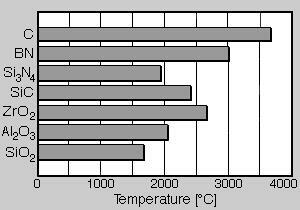 application temperatures are compared by boron nitride with those of graphite. At the same time the application conditions, i.e. 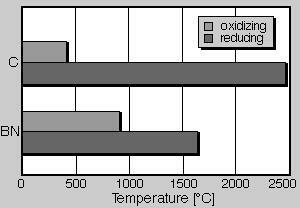 oxidizing or reducing atmosphere are considered. Under reducing conditions boron nitride can be used to approximately 1650°C, graphite up to 2500°C. With oxidizing conditions this picture turns around, here an application of graphite is possible only to approximately 400°C, at higher temperatures it oxidizes to CO2. Boron nitride however is stable at air to approximately 900°C. With good crystallinity an application to 1000°C can be achieved. With a thermal stability up to 900°C boron nitride is clearly superior in contrast to graphite. Thus boron nitride is thermally stable in the temperature range, in that light alloy materials are casted. Wetting behaviour. One of the most well-known characteristics of boron nitride is its small wettability by a whole set of melts. This is also true for metal melts, e.g. aluminium and magnesium as well as their alloys. Usually the wetting of ceramic materials by melts is described by the specification of a wetting angle, which is usually determined by the use of a heating microscope according to the method of the "sessile drop". Here the contact angle of a melt drop on the substrate is measured by a tangent. This is shown in principal in fig. 5. Large angles (> 90°) mean a bad wettability according to the drawn example, small angles (< 90°) represent a good wettability. In three curve paths fig. 6 shows the wetting behavior of aluminium on boron nitride, with from Si3N4 and Al2O3. Here it is to be detected clearly that up to a temperature of 900°C boron nitride indicates a wetting angle of approximately160°, i.e. it is very badly wetted by aluminium. 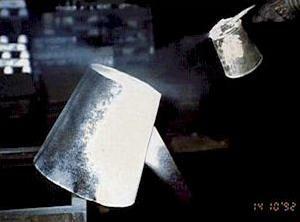 In the temperature range from 900 to 1000°C the wetting angle drops clearly, and the wetting increases. 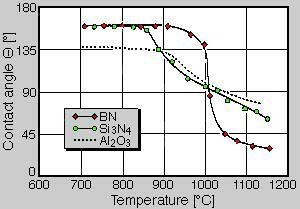 In addition, in this temperature range the values of boron nitride are situated above those of Si3N4 and Al2O3. Also from this drawing it can be detected that boron nitride can be used very well as parting agents up to 900°C when pouring aluminium melts. Between 900 and 1000°C wetting conditions can be still achieved, which are superior to other ceramic materials . The boron nitride coating developed for the application within the foundry area is present in an aqueous suspension. In fig. 7 a ladle used in an aluminium sand and gravity die foundry is coated with a boron nitride coating. Here the coating is sprayed on a ladle warmed up to approx. 100 to 120°C using a blowing cup. Best results are obtained if the coating is applied in a thin layer. Layer thicknesses of approx. 50µm are sufficient. Application of thicker layers would not be meaningful, since boron nitride is a very good heat conductor. Thus no isolating layers could be produced in this way, as it is known from insulating coatings. Also different types of application like brushing or dipping are possible, however preference is often given to spraying for economic reasons. Fig. 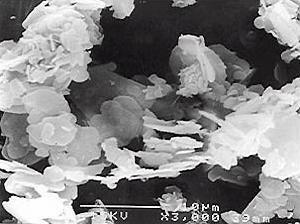 8 shows an electron micrograph of a sprayed and dried boron nitride coating in an enlargement of 3000 times. The line of sight is perpendicular on the surface of the coating layer. Due to their plate-like shape most boron nitride particles arrange themselves parallel to the surface of the coated object, only a few boron nitride particles can be found in a perpendicularly or diagonally position. Thus they form a relatively close layer, which is impermeable for metal melts. The very good non-wetting behaviour of boron nitride coating becomes visible with the use of ladles, since these are accessible usually to the direct observation. In fig. 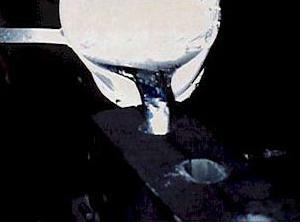 9 the application of a ladle coated with boron nitride coated is to be seen when casting gravity die castings. An aluminium alloy is poured. The small non-wetting tendency of the boron nitride coating can be clearly detected. No melt remainders are visible above the melt. Also at the lower surface of the ladle are no adhering melt remainders, although this was immersed beforehand for filling with melt completely into the melt. The good non-wetting effect of the boron nitride coating prevents the formation of oxide films, which were brought in otherwise when emptying the ladle into the holding furnace. Also when pouring magnesium alloys good experiences were made with the application of boron nitride coatings. So the oxide formation can be avoided when pouring magnesium ingots by the use boron nitride coatings. 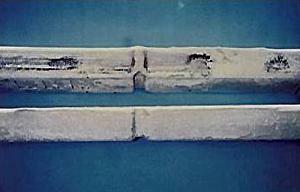 As example two magnesium ingots of the alloy AZ91 (G-MgAI9Zn1) are shown in fig. 10. The upper ingot was poured in a uncoated ingot mould, the lower ingot in one with boron nitride coating coated ingot mould. Clear oxide formation is to be detected in the form of black marks on the upper pig, which are missing on the lower pig. The suppression of the oxide formation is desirable, since otherwise with remelting processes the oxides in the melt enrich themselves. It could be observed that the oxide formation is suppressed even with purer magnesium alloys, although these alloys have a higher tendency to oxidation. This applies e.g. to an alloy of the composition AZ31 (G-MgAI3Zn1), in addition, to zinc-free alloys such as A7, A5 or A2 (G-MgAl7, G-MgAl5 or G-MgAl2). Further areas of application for boron nitride coatings are to be found e.g. within the area of the brass gravity die casting. First attempts carried out show that the moulds can be coated with boron nitride coatings. The boron nitride coating is diluted in the ratio 1:10 to 1:20 with water and can be sprayed directly on hot moulds having a temperature of approx. 300°C. Here the possibility exists of replacing the graphite based release agents used so far by boron nitride coatings. The shown examples for the application of boron nitride coatings are not complete. Further application possibilities, which use the good melt-rejecting effect of the boron nitride with simultaneous thermal stability, are to be found both within the range of research and development and in production. Boron nitride shows a number of interesting characteristics like a good thermal stability and a very good non wetting effect, which let its use as refractory filler in foundry washes and coatings appear meaningful for pouring aluminium and magnesium alloys. For this appropriate use coating on the basis of boron nitride are developed and their application in the practical foundry operation tested. Coatings on the basis of boron nitride can be used whenever a release agent with a refractory filler is needed, which is characterised by a high thermal stability and does not like graphite already oxidize at low temperatures. A further advantage of boron nitride coatings is the small wettability by aluminium and magnesium melts as well as their alloys. Thus the formation of oxide films is suppressed or strongly reduced. Beyond that is boron nitride of white colour, which should be seen also under the criterion of the efforts to create a "white foundry". Rudolph, S.; Klein, F.: Giesserei-Praxis (1992) Nr. 6, S. 81 - 84. Lipp, A.; Schwetz, K. A.; Hunold, K.: Journal of the European Ceramic Society 5 (1989) Nr. 1, S. 3 - 9. Nicholas, M. G.; Mortimer, D. A.; Jones, L. M., u. a.: Journal of Material Science 25 (1990) S. 2679 - 2689. Download entire publication as pdf (in Geman).